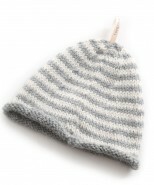 A beautiful baby beanie hat knitted from super soft baby alpaca in cream and teal. Baby alpaca is perfect for babies, it's light yet warm and super soft and gentle on skin and with hypoallergenic properties, you can be sure little ones will not be irritated by this luxurious natural fibre.There are adorable matching booties too to complete the set! 0-6 months.